The Agony of Apostrophes is for anyone who has ever had trouble working out where an apostrophe should go or whether an apostrophe is needed at all. It deals with almost every apostrophe dilemma you are likely to come across and is packed with examples and explanations to back up the rules. How many times have you looked for the answer to your query in a grammar book or other source only to find that it doesn't address your particular problem? Look no further for the answer to your apostrophe query than in this book. The author, Sylvia Fielding, has been answering queries on apostrophes via her website for many years and has based the book on the real-life questions that people have asked. When asked why she wrote the book, she replied, "I've always loved answering people's apostrophe queries and I wanted to provide a comprehensive resource that would provide the answers to both the common and not-so-common dilemmas that people face and, indeed, agonise over." This book is for all ages and is one that you will undoubtedly refer to again and again. 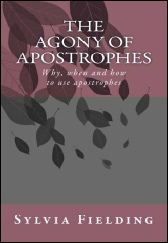 "Sylvia has produced a fresh and succinct way of mastering the use of the apostrophe. I particularly liked her many references to the everyday use of language. I thoroughly recommend it as an invaluable reference for all those involved in learning and teaching." Click on the book image to go to Amazon.co.uk to purchase a copy of the book.